What would separated bike lanes look like in Toronto? 9 years ago ago by James Schwartz. NYC's 9th Ave separated bike lane. Photo by James Schwartz of The Urban Country. No definitive plans for separated bike lanes have been put forward in the Minnan-Wong announcement, and much will change before anything becomes reality if the plan is successfully passed. Much of the talk so far has been about putting both bike lanes on one side of the street. 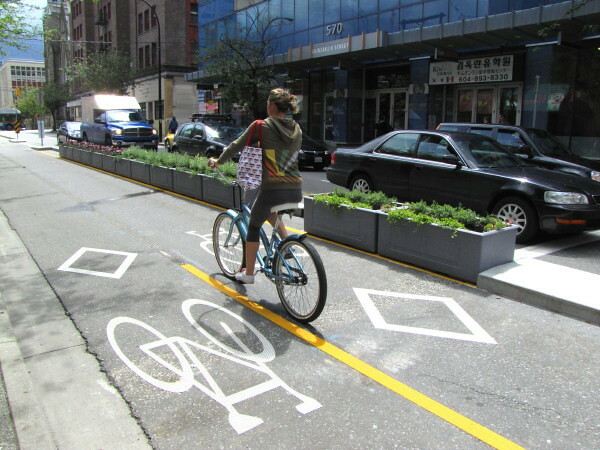 It shouldn't stop us from thinking about the different possible configurations, particularly since there exist a number of different ways to create separated bike lanes (also called cycle tracks - not really bike lanes or bike paths). 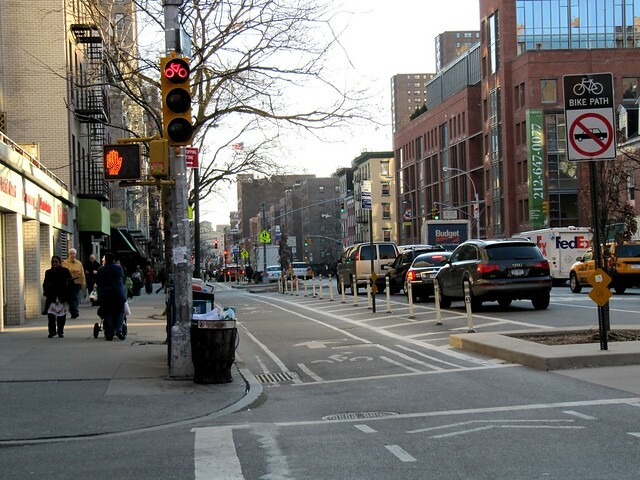 For instance, one configuration would be just installing install flexible plastic bollards, which would provide a comfortable, but permeable, barrier between cars and bikes. 8 years ago ago by Ray Van Eng. Dunsmuir Street Bike Lane, Vancouver. Photo by Ray VanEng. Another option would look a like what I'm guessing Minnan-Wong and Allan Heisey prefer, where a two-way cycle track exists on one side of the street with a substantial curb in between intersections. A lot of people would find this appealing and may be suitable to install on either Adelaide or Richmond, allowing the other one to be turned into a regular two-way street. In Toronto examples of this include the path on the north side of Lakeshore East and on the south side of Eglinton and west of the Humber. These roads have fast traffic with fewer intersections, making it easier to install a cycle track off the main road. Montreal has been building similar two-way separated bike lanes for years (thanks CycleToronto). More recently they've been installing more substantial curbs with gaps for intersections and driveways, presumably to increase the comfort level for cyclists and prevent driver incursion. Most of Montreal's two-way routes, however, still have widely spaced bollards, which don't really prevent drivers from parking right in the lane. A two-way cycle track, however, can require substantial work to implement on some streets, such as on St. George/Beverly, so we should be open to other ways of increasing our comfort with minimal effort and upset. 9 years ago ago by Spacing Magazine. Copenhagen bike lane. Photo by Spacing Magazine. In this configuration there is a thick boulevard between a one way cycle track and the car traffic. Presumably the other way cycle track is on the other side of the street. cnathere are bike boulevards all over copenhagen! 10 years ago ago at Copenhagen, Hovedstaden, Denmark by Brynn Evans. Copenhagen bike boulevard. Photo by Brynn Evans. This bike boulevard looks to be an older Copenhagen version, made with less care than the newer ones with better intersection treatments, though it still provides some comfort with grade separation. In some existing bike lanes providing a grade separation between the car traffic and the pedestrians may help, particularly when there isn't room for a more substantial barrier. Washington DC contraflow separated lane. Photo by Dylan Passmore. This contraflow separated lane looks like it works well: allowing cyclists to go against car traffic and has bright, plastic bollards to delineate the different travel lanes. Washinton DC has a lot of one way streets where this might be useful. I can imagine some of Toronto's existing bike lanes getting such a treatment. These plastic bollards are easy to install so it can also enable the city to experiment (like they were proposing to do with University). Not every city has taken the same care in designing these facilities. Like anything they can be done badly. Whatever is chosen, I hope some research into the best practices of New York City, Vancouver, Montreal, Copenhagen, Amsterdam and elsewhere are taken into account. New York City just published a study of their Prospect Park cycle track and have shown that it has vastly exceeded their expectations: speeding car traffic has been reduced greatly; weekday cycling has tripled; sidewalk cycling has fallen to 3% from 46%; car traffic volume has actually increased; crashes and injuries have dropped substantially. "sidepath" is another common word used in North America for these types of facilities. In this case, typical traffic is very slow and very congested with a high proportion of lost tourists circling endlessly as they search in vain for free parking (there ain't no free lunch or parking near the beach in Santa Cruz). I know this isn't a very popular stance, but I like riding with the cars. I also know that many more people would rather have such facilities and that they could encourage a great many more cyclists to take to the streets... so I'm kind of torn. For myself, all I really want or need is smooth pavement. That is the point this network isnt for you , an experienced urban cyclist and/or road warrior. It is for people who aren't riding today. It is for cyclists with young children on the back of their bicycles or cyclists with children who cant safely ride in traffic. It is for people like Denzil Minnan Wong who is a 45 year old man who learned how to ride a bicycle last year for the first time. Don't assess this proposal based on your need for it. You are already riding downtown you have decided you dont need separated lanes to bicycle downtown. 95% of the population in this city is too afraid to ride downtown. We need to welcome and encourage them to do so. That sounds reasonable at first glance. But then I wonder, okay, if this is for people who can't ride safely "in traffic", exactly where are they starting from, and where are they finishing up? The proposed network is of limited extent. What exactly will happen to those who can't ride safely in traffic when they get to Richmond and John, or St. George and Hoskin, and need to continue? They'll either have to ride in traffic, or on the sidewalk (good luck with that), or get off and walk the bike, or--? I can't see the people who are currently afraid of riding downtown having any way of getting downtown to the separated bike lanes, nor going to very many useful destinations beyond Harbourfront, so this isn't going to help them much. It also seems silly to support a scheme if it really, as stated above, isn't for experienced current riders. Are we unworthy? Shouldn't existing riders get some benefits as well? It's not like existing riders are being excessively catered-to and coddled, except maybe for the Goodman trail clearing (I don't expect very many casual riders on the shores of Lake Ontario in February). If you asked me where the money should be spent, I'd say on repaving streets which have lots of bicycle traffic. Queen St., a popular route, has many bad patches eastbound between Spadina and York, and is almost unrideably bad westbound through Parkdale. I think Sherbourne may be fixed now, but when I was regularly riding it five years ago its pavement was in horrible shape from repeated utility patches, as were sections of Beverly. One issue is whether separated/dedicated lanes should become the backbone of Toronto's cycling infrastructure; the other issue is how should they be designed for our streets. 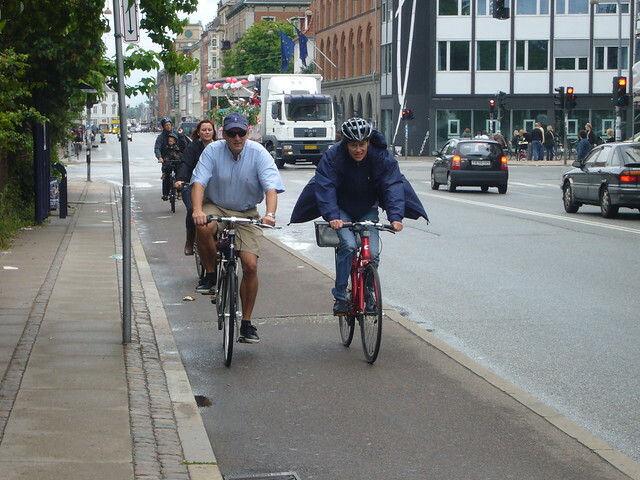 My experience is with riding in Copenhagen and their lanes worked very well. There is some confusion by the various terms used to describe a lane or path or boulevard, etc. The pictures above are a good example of Copenhagen's style: essentially bike sidewalks, they're raised from the road by a few inches and don't have bollards or other kinds of barriers. Where cars are allowed to park on streets (which isn't the case on most arterial roads), there is often a tree lined boulevard separating parked cars and their doors from cyclists. I'll post a few photos I took on Cycle Toronto some day soon. I support the network idea of separated lanes in principle; my issues would be more geared toward design and engineering elements. But I think the most important thing to remember is that we will be developing this infrastructure over time and while the network would only be a few streets to begin with, the hope would be to build them such that they can be expanded further and onto more streets. Hydro corridor paths and better connections with transit will allow all cyclists regardless of experience level to have a better, safer and well integrated system to use their bike around the city. I also think the issue is about encouraging more people to cycle and the reality is that many are afraid of being hit by a car and so don't ride. These networks will provide a safe space and, importantly, provide space for younger, older, and less experienced riders - not to mention the bike "mini van" which is very popular in copenhagen; a cargo bike so that parents can ride their young kids to school, etc. - super cute! We should celebrate the idea of people from all ages, skill levels, and walks of life getting out of their cars and onto bikes. But... I do agree that there needs to be some education for cyclists about how to ride on the road. In Denmark, all children are taught how to ride in school and have to pass road tests so that they know the rules and how to bike safely. Over time, having grown up with their parents and being around bikes so much, it becomes second nature.